This badge was named after the royal palace in Fife and appears for the first time in 1493 in the Exchequer Rolls. The design is based on the arms of the Royal Burgh of Falkland. The badge alludes to the hunting purpose of the palace and was registered in 1998. 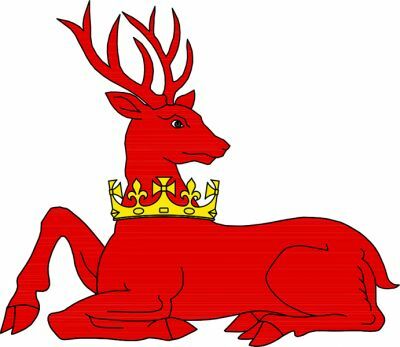 Blazon: A Stag lodged regardant Gules, gorged of a coronet of four fleur-de-lys (two visible) and four crosses pattée (one and two halves visible) Or. SOURCE/NOTES & CREDITS: Background illustration from the website of the Court of the Lord Lyon. For the blazon and some of the text information: Then Lyon Clerk and Carrick Pursuivant of Arms, Mrs. C. G. W. Roads, MVO, in her article in “Double Tressure”, 1998, No. 20, pages 84 & 85. For further text, pages 51, 104 & 105 from “Officers of Arms in Scotland 1290-2016”, pages 79-80, by Charles Burnett, Scottish Record Society, Edinburgh, 2016 and from biographical information found in the website of the Court of the Lord Lyon. The text used was based on and adapted from these sources. The Falkland Pursuivant of Arms Extraordinary is Roderick Alexander Macpherson appointed in March 2018. The most recent previous holder of this office was George Alexander Way of Plean 2016-2017. This office has been frequently used for temporary appointments. To date the person holding this office most frequently is Peter de Vere Beauclerk-Dewar who has held it seventeen times between 1975 and 2014 for duties in connection with the installation of new members of the Most Ancient and Most Noble Order of the Thistle.